The phenomenon of the “noble savage” stereotype emerged as a response to the crude and primitive depiction of Indigenous groups within literature. The common ethnic stereotyping that type-casted Indigenous characters as barbaric and savage-like in nature was a fundamental aspect of Indigenous representation; this was a widespread literary concept up until the 18th century (“Noble Savage: Literary Concept”). As a result, writers and philosophers attempted to counteract this discriminatory stereotype with another form of literary misrepresentation. The character of the “noble savage” symbolizes the purity and innate goodness of the Indigenous populace that has not been corrupted by westernized civilization (“Noble Savage: Literary Concept”). Although this phenomenon is viewed as inherently heroic, the stereotype is representative of the often superficial means that the Indigenous were exalted for. While with historical perspective it is evident that such racializations were romanticized and non-reflective of the Indigenous minorities they portrayed, these stereotypes were initially intended to steer public opinion and strengthen nationalistic pride. 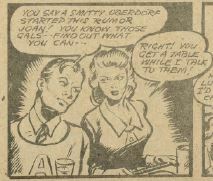 These nationalistic sentiments are exemplified within the character of Red in Active Comics, no. 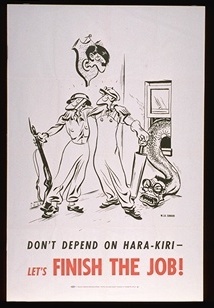 11 (1943). 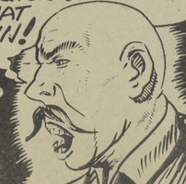 Within both the issue and the story of “Dixon of the Mounted”, Red is the only Indigenous character depicted. His limited representation speaks volumes of the portrayal of Indigenous people within literature, as he is used sparingly and is characterized as inarticulate and simple-minded. Still, his role is ultimately heroic, and he helps the main character Corporal Dixon to capture a drug lord on Canada’s home front. During a time when Canadian Indigenous people were mistreated and erased from the public eye, the role of Red as a protector is worth focusing upon. In the text, Red performs many noble deeds that are uncharacteristic of the Indigenous stereotype of the time. This creates a change in perspective and national identity relating to Indigenous populations and Canadians as a whole. 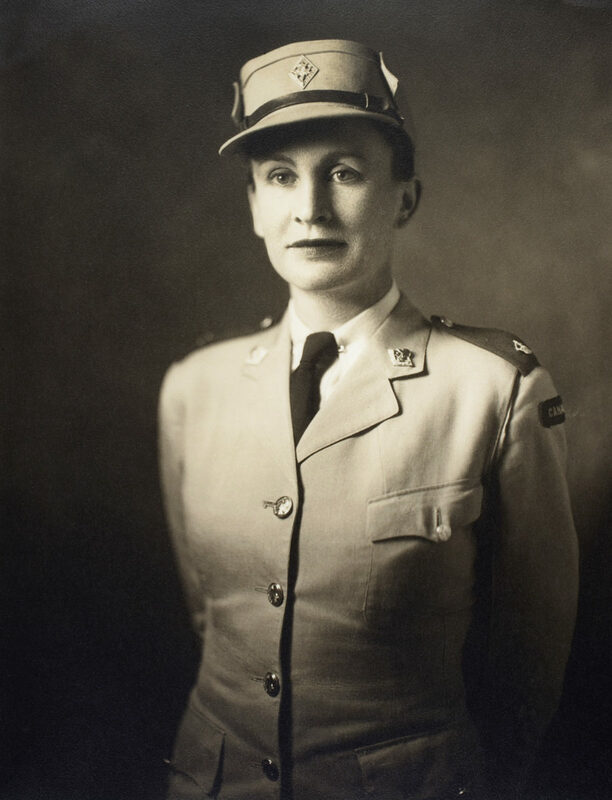 Even though his role is a romanticized idealization, the stereotype of the “noble savage” strengthened the sense of unity in the country which was important to increase the low morale during the Second World War. Nevertheless, when a greater enemy, the axis powers, arose during the Second World War, unity within the country became more important than the prior racial tensions. Thus, in an attempt to unify the country, the media began to close the perceived gap between Indigenous people and the Caucasian majority. Although the “noble savage” idea was inaccurate and fabricated to be propaganda through literature, it promoted unification of the country while maintaining the disparity between the two groups. The wide distribution and appeal of the Bell Features comics fortified this depiction of Canadian identity within popular culture. The portrayal of heroic Indigenous characters was a means to build national pride. Thus, the literary idealization of the Indigenous populace and the use of the comic industry as a political tool will be studied to evaluate how these concepts were used to elevate the “noble savage” stereotype as more than just a romanticization, but also a nationalistic discourse to support the Canadian home front. Fig. 1. René Kulbach. 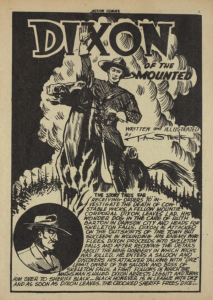 Page from “Dixon of the Mounted”. Active Comics, no. 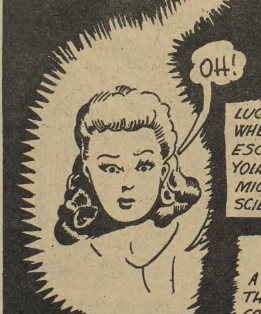 11, May 1943, p. 3. Bell Features Collection, Library and Archives Canada. the third-person and speaking in broken-English, the trapper goes out of his way to aid the Corporal on his mission. An in-text narration in the third panel of Figure 1 reads: “The Indian finds his stunned friend and brings him to the sleigh to bandage his head” (3). This line perpetuates the derogatory portrayal of Indigenous within popular literature: the reference to Red as an “Indian” rather than referring to him by his name is a derogatory typecasting, further emphasized by the mention of Corporal Dixon as his “friend”. 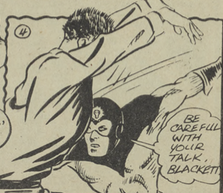 In essence, this compartmentalizes the larger issue of ethnic stereotyping by establishing a power dynamic between Red, as a good-natured “Indian” who would go to drastic measures to protect his country and his white Canadian “friend,” the Corporal. This dehumanization is an effective introduction to enlighten and open audiences to diversity by showing Indigenous characters in a non-malevolent manner. The valiance and courage of Red throughout the mission fortifies his role as a “noble savage” character. His actions in protecting his reserve and exposing the drug ring are ultimately recognized as home front efforts. 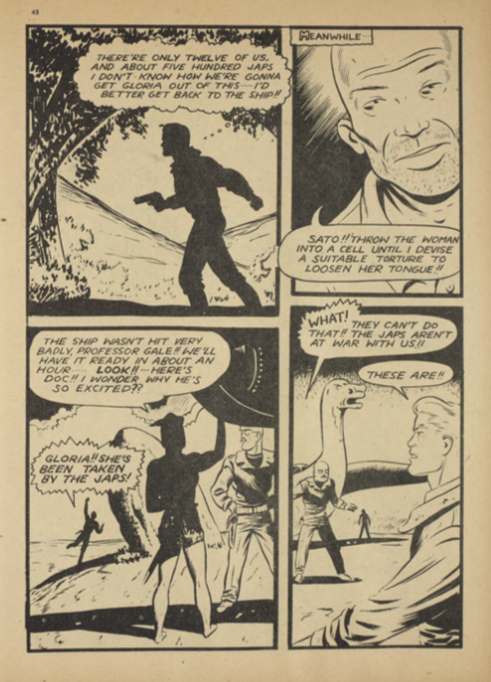 In this manner, the “noble savage” stereotype is employed as a nuanced propaganda approach throughout the comic to inspire and coax the readership into engaging in the war effort. The significance of the creation of an Indigenous ally such as Red cannot be rationalized without an understanding of the political landscape in which he was created. 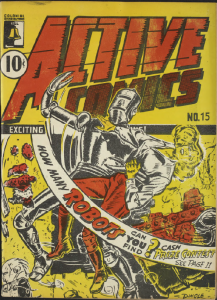 After trade restrictions led to a ban of American comics during the Second World War, the boom of the black-and-white “Canadian Whites” comics documented a shift in popular culture and development of a national identity (Bell “Comic Books”). The tribulations to build a consistent political ideology for Canadian citizens was notably challenged in the years leading up to the Second World War. As a result of several misleading propaganda campaigns enrolled by the United Nations, most of the Canadian war efforts were discredited within the public sphere. 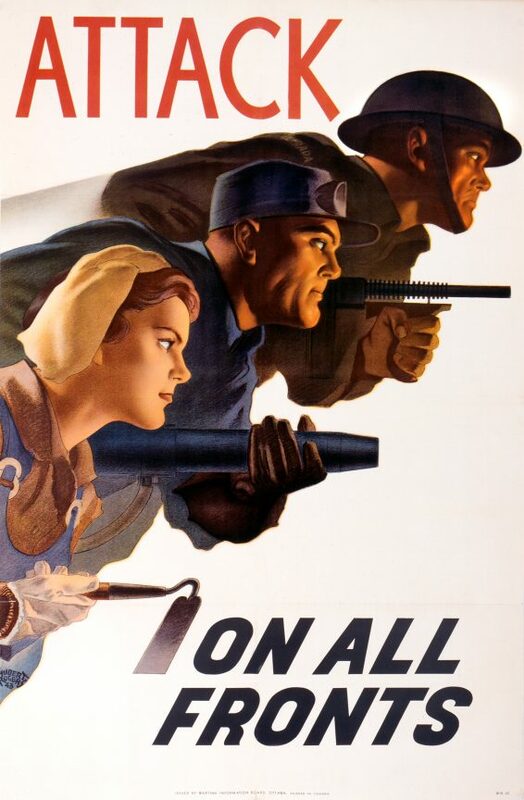 The lack of global recognition was infamously punctuated by the British Royal Army in a propaganda campaign that maintained the false beliefs that British efforts in the war were unaided and solitary, implying that Canadian war efforts were futile (Bumsted 291). Fig. 2. Christopher Woods. Lieutenant-Colonel J.F.R. 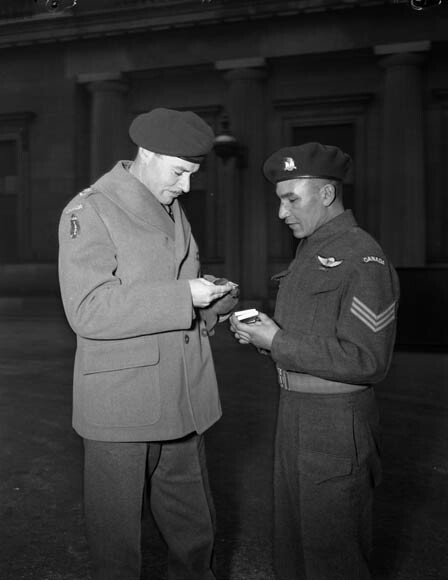 Akehurst, Commanding Officer, 2nd Battalion, First Special Service Force, Examines Sergeant Tommy Prince’s Military Medal, Which Was Awarded for “Distinguished and Gallant Service” at Anzio. Buckingham Palace, London, England, 12 February 1945, 1945, Faces of the Second World War Collection. Library and Archives Canada. Public Domain. These publicized allegations were an under-acknowledgement of Canada’s substantial assistance and support of the allied forces, as they enlisted roughly 1.1 million soldiers, at least 6,000 of which were Indigenous minorities, including Sergeant Tommy Prince as seen in Figure 2 (Bumsted 291). Regardless, there was significant advocacy for Canadian values, such as humility and responsibility, in attempts to raise troop morale. An emphasis on the underlying value of freedom and honour for the better of the collective community was a humble approach perpetuated as an integral aspect of Canadian values. This notion was also referenced by Bumsted as he notes that the Canadian populace served in the war with no “ulterior motives or expectations of advantage” (289). 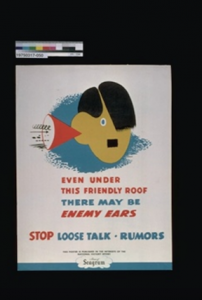 However, the overarching message of the Canadian propaganda differed from the tactics of the British Royal Army, which emphasized independence and dignity. Rather, the Canadian identity valued humility over dignity and the protection of allies for the greater common interest. These values are exemplified by the plot lines and heroes championed within the comics, who are framed by ideologies regarding compassion and servitude, which can be interpreted as humility (Grace and Hoffman 4). Following this manner, Red’s depiction reflects the core Canadian values that were being promoted at the time. For instance, Red is written patriotically in the way that he sees the merit in the Corporal’s needs above his own and lends his aid for the greater purpose of Canada’s protection. 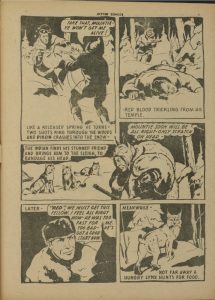 Red’s humbleness and devotion to the protection of his allies, as well as his nation’s common interest, capture the distinct Canadian identity values of the time in a manner that the comics could contrast from the British values. For that reason, Bell Features comics saturated literature through their popularity and availability, consistently perpetuating these Canadian values to strengthen the national identity. Thus, themes of Canadian patriotism became major selling-factors in the absence of the American comic books and solidified the industry as a cultural influence within literature. 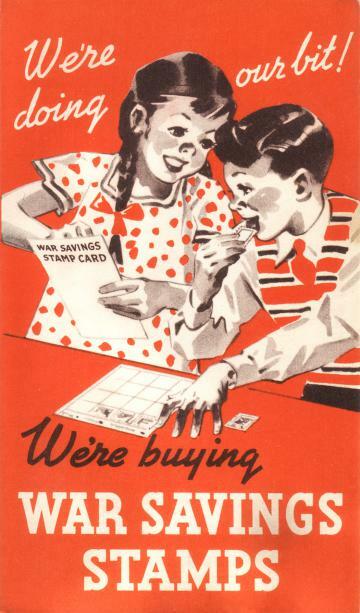 The concept of the “core notions of national membership” is investigated by authors Takeda and Williams by portraying how Canadians were expected to be an active participant in their country, particularly during the wartime (80). 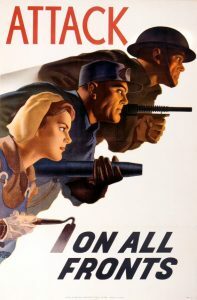 To be a member of one’s nation during the Second World War implied that citizens needed to be active participants in the war relief efforts, by building comradery with each other. The authors’ note that this was projected through propaganda and literature to establish a sense of “political stability” (84). This, in turn, discouraged ethnocentrism and promoted tolerance. Tolerance was important during the war, since a single force could not be considered unified if it were plagued by inner conflicts that weakened the whole. 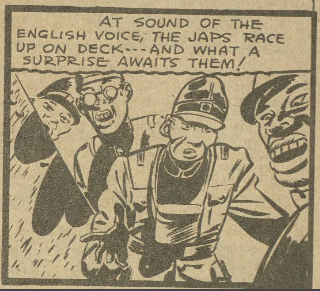 This emphasis of unification is exemplified within the Canadian comics, which employed diverse characters as a means to reinforce national unification; such ethnically diverse characters had never been depicted to this extent prior to the wartime. 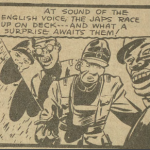 By promoting characters such as Red within the literature, comics were simultaneously inspiring their readers with nationalism and empathy for the diverse people of Canada. This had the ultimate effect of improving the unification of the country. Thus, the Canadian comic book industry was a part of an overarching wartime effort to strengthen and unify the bonds between the individual members of the Canadian population. 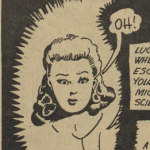 In conclusion, the comic book genre facilitated empowerment by engaging young readers with more diverse heroes, promoting acceptance and actively creating a stable Canadian home front. The widespread popularity and distribution of Bell Features comics advocated Canadian values and fortified the depiction of the Canadian identity. Essentially, serving Canada involved responsibility and active engagement in the war efforts, no matter ethnicity or political view. The representation of Indigenous minorities was building nationalistic pride and responsibility as a Canadian citizen, which in turn was being promoted to the young readers of the time. The notion of defending Canada reflected the core Canadian values, humility and protecting allies, and was intended to inspire nationalism in the youth (Grace and Hoffman 4). Through an analysis of Indigenous representation, the significance of the “noble savage” stereotype, and the comic book genre’s influence within Canadian literature as a political tool, the character of Red in “Dixon of the Mounted” encouraged unification among the Canadian population and bolstered the Canadian home front during the wartime. Indeed, the national discourse promoted through the use of such heroic Indigenous characters elevates them as a cornerstone for what the Canadian identity should entail: humility, and tolerance for the diversity which makes up our nation. Bell, John. 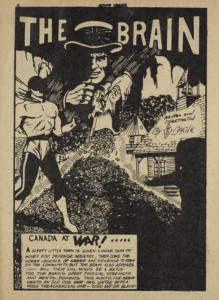 “Comic Books in English Canada.” The Canadian Encyclopedia, Historica Canada, 8 July 2015, https://www.thecanadianencyclopedia.ca/en/article/comic-books-in-english-canada. Bell, John. Invaders from the North: How Canada Conquered the Comic Book Universe. Dundurn, 2006. ProQuest Ebook Central, https://ebookcentral-proquest-com.ezproxy.lib.ryerson.ca/lib/ryerson/detail.action?docID=611683#. Bumsted, J. M. The Peoples of Canada : A Post – Confederation History. Oxford University Press, 2008. ProQuest, http://search.proquest.com/docview/887547210/citation/526E25B14D344555PQ/1. Campbell, Grant. 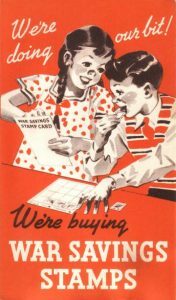 “William Collins during World War II: Nationalism Meets a Wartime Economy in Canadian Publishing.” Papers of the Bibliographical Society of Canada, vol. 39, no. 1, 2001, pp. 45-65, https://jps.library.utoronto.ca/index.php/bsc/article/view/18199. “Noble Savage: Literary Concept.” Encyclopædia Britannica, Encyclopædia Britannica, Inc., 5 April 2016. www.britannica.com/art/noble-savage. Grace, Dominick, and Hoffman, Eric. 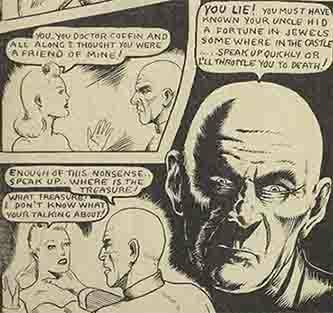 The Canadian Alternative: Cartoonists, Comics, and Graphic Novels. University Press of Mississippi, 2017. Ryerson Library. Woods, Christopher. Lieutenant-Colonel J.F.R. Akehurst, Commanding Officer, 2nd Battalion, First Special Service Force, Examines Sergeant Tommy Prince’s Military Medal, Which Was Awarded for “Distinguished and Gallant Service” at Anzio. Buckingham Palace, London, England, 12 February 1945, 12 February 1945. Faces of the Second World War Collection. 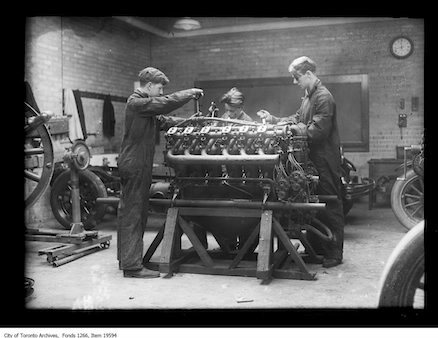 Library and Archives Canada, 3191549, http://www.bac-lac.gc.ca/eng/discover/military-heritage/second-world-war/faces-second-war/Pages/item.aspx?IdNumber=7.